Several months ago, as they are prone to do, Ben & Jerry's introduced another limited batch flavor to add to their expansive list of flavors. 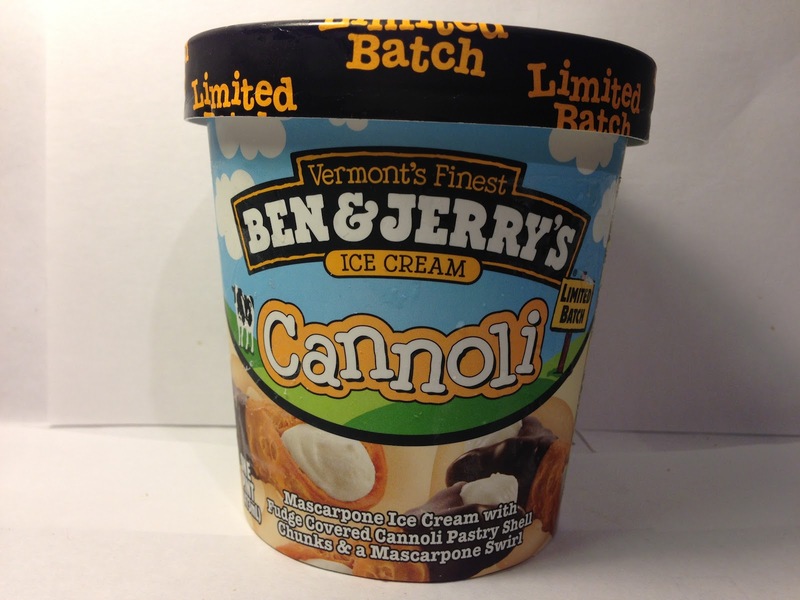 This Ben & Jerry's Limited Batch Cannoli Ice Cream was so difficult to find that they even started a social media campaign called #FindCannoli that allowed people to post where they had found a pint in their local stores. I had been checking that page and my stores periodically and had never been able to find it, but while stumbling through Meijer the other day looking for something to quench my absurd ice cream infatuation, I was stunned to find a pint of this previously unseen Cannoli ice cream staring me in the face in the freezer case. Since I'd been looking for it for months, I quickly gobbled up even at the non-sale price of $3.99, which I rarely ever do, and brought it up to add to my Ben & Jerry's review series. As always, this pint container contains four half-cup servings of ice cream and each serving comes in at a belt-busting 280 calories. Unhealthy and calorically heavy ice creams are nothing new for Ben & Jerry's, so there's no surprises there. I'll be the first to admit that I haven't eaten a lot of Cannolis in my life, but I have had enough to know that I know what they taste like and I like them. The fact that they are trying to put this into ice cream form is more than intriguing for me, so I was anxious to try this out after my long and arduous search. The container describes this as "Mascarpone Ice Cream with Fudge Covered Cannoli Pastry Shell Chunks & a Mascarpone Swirl" and as you can see above, there were fudge covered pastry shell chunks and there also was Mascarpone ice cream, although I'm not sure how you add an additional swirl of Mascarpone to something that is already flavored that way, although when you look closely enough, you can see some slight discoloration that could be classified as a swirl I suppose. Regardless, there was Mascarpone and pastry chunks, so at least they delivered there. The Cannoli pastry shell chunks were airy and flaky just like the pastry itself and the fudge wasn't particularly hard, but it was hard enough to hold up to the ice cream. The ice cream itself smelled just like the Mascarpone filling in a Cannoli, so in terms of presentation, Ben & Jerry's was batting 1.000 on this one. The first thing I did with this was take a spoonful of the ice cream and see how it compared to the it's namesake Mascarpone and I can honestly say that it was a pretty good representation. It was sweet, moderately fluffy (for an ice cream) and had that somewhat sweet cream cheese-like flavor that the filling of a Cannoli typically has. One thing of note is that when I said this was sweet, I meant it. Don't be expecting anything tame when you try that out. Next was a taste of the pastry shells themselves and I can say that they also did a pretty good job representing their namesake too. They had a light and airy crunch to them and the chocolate fudge covering brought an additional sweetness to the equation, but not nearly as much as the ice cream itself. Mixed together, this was a whole lot of sweetness and a whole lot of decadence, but ultimately, it was a pretty accurate representation of a cannoli transplanted into ice cream form. Buy It or Fly By It? It's not something I do regularly, but I can typically polish off a pint of ice cream pretty easily. In the case of this pint, that was not an option because this was extremely sweet and I could only finish off about half before I had to stop (not that my waistline minded that). That said, despite its extreme sweetness, this was a pretty good tasting pint of ice cream and did a more than admirable job of representing its namesake, so it gets a BUY IT rating. If you are one of the fortunate ones that sees this in the freezer case at your store, make sure you grab a pint and give it a shot yourself because if you can stand the sweetness, I think you'll like this quite a bit. 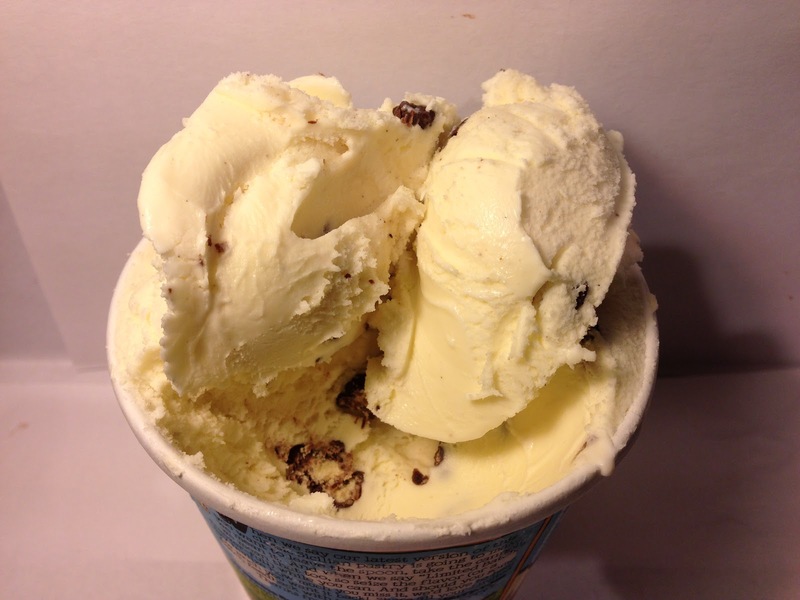 Other Review: On Second Scoop, The Ice Cream Informant.